A ship abandoned in the Arctic more than 150 years ago while searching for Sir John Franklin's expedition has been found. HMS Investigator, abandoned in the Arctic 155 years ago during a search for Sir John Franklin's expedition, has been found. Parks Canada archeologists looking for the ship found it 15 minutes after they started a sonar scan of Banks Island's Mercy Bay in the Northwest Territories, said Marc-André Bernier, chief of Parks Canada's underwater archeology service. 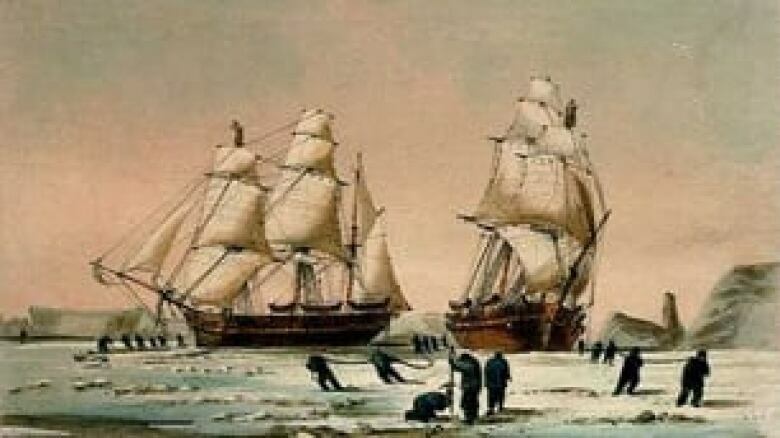 HMS Investigator, left, is trapped in ice with HMS Enterprise in a painting by Lt. W.H. Brown of the Royal Navy. The ship was eventually abandoned and its crew rescued by a Royal Navy sledge team. ((National Maritime Museum))"When the team arrived [on July 22], the whole bay was covered in ice," Bernier said. "On July 25, the team had an opening in the ice.… It happened to be where the ship had been abandoned." They started a sonar scan of the area identified by British navy accounts as the spot where the ship had been left. They used a torpedo-shaped scanner, towed behind a Zodiac inflatable boat, which sends out sound waves and produces images of the floor of the bay. "After 15 minutes, they basically had an image of the wreck," Bernier said. "It's in good condition," he said. "Very good condition, actually — surprising condition." 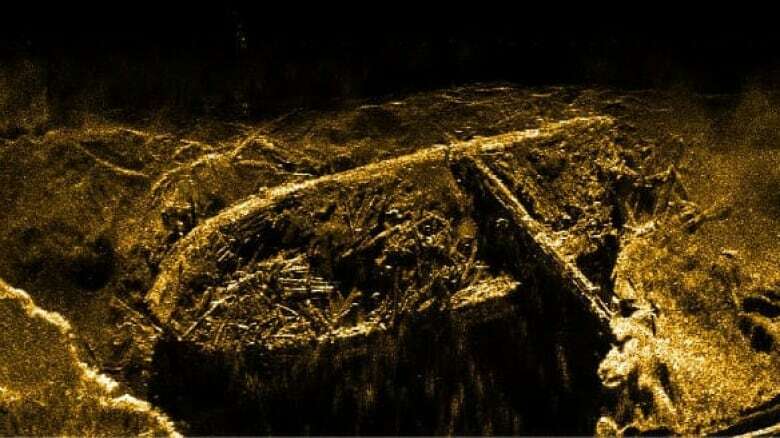 The ship is upright in about 11 metres of water, its bottom buried in sediment if it's still there, and the upper deck under about eight metres of water. "Apparently, you can see some of it from the surface when the water is clear," Bernier said. While the masts are gone and the bulwarks — the sides of the ship that extend above the deck — are mostly gone, likely damaged by ice, there is potential to find smaller artifacts, Bernier said. "This is very cold water. That helps preservation as well," he said. One of the masts appears to be on the deck of the ship, he added. If the masts had still been in place, they would have stuck out of the water. The archeology crew has no plans to raise the ship. They will do a thorough sonar scan of the area, then send a remotely operated vehicle, similar to the ROVs used to take pictures of the BP oil leak in the Gulf of Mexico, to take pictures. They will analyze the condition of the ship, the environmental impacts that could cause further damage, and the potential to find further artifacts — though they will remove nothing at this point. Before departing to go to another ship, the crew of HMS Investigator buried their cargo on Banks Island. Remains of the barrels indicate the cache's location. ((Courtesy of Western News))"The work really starts now for the archeologists," Bernier said. The ship hadn't been found earlier because of the difficulty involved in getting access to the area and surveying the bottom of the bay, which is usually covered with ice, Bernier said. The ship was stuck in the ice for more than two years before it was abandoned, he noted. The Investigator, captained by Robert McClure, was sent in 1850 to search for Franklin's crew and their two ships, the Erebus and Terror. After more than two years trapped in the ice at Mercy Bay, crew members were rescued by a Royal Navy sledge team, who took them to another ship. In the end, McClure and the Investigator succeeded where Franklin failed — they are credited with finding the Northwest Passage. "This is the ship that confirmed and nailed the existence of that passage," Bernier said. Before leaving the ship, the crew buried much of their cargo on Banks Island. The location of their cache was known and is also being investigated by an archeological crew on land. The land crew has found three sites of interest, including the gravesites of three crewmembers who died of scurvy in April 1853. "They're about 60 metres from the cache site," Bernier said. "They seem to be in an undisturbed condition." A magnetometer has indicated there is metal in the graves, but they will be left undisturbed, he said. The British government has been informed of the find and will be consulted about what will happen at the gravesite. The other two sites hold the remains of the cache and pieces of a small boat, Bernier said. In addition to the British navy accounts that led the archeologists to the Investigator, Inuit oral tradition tells stories of the ship. "This is alive in the Inuvialuit memory today," Bernier said. The Investigator site "had a major impact" on the Inuit because it was a source of copper and iron, he said. In fact, the pieces of the small boat found on shore should have metal nails in it, but they have all been removed. 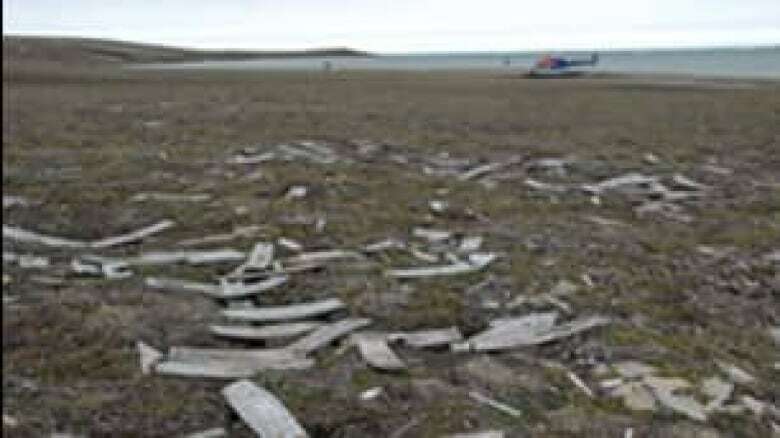 "It was a resource site for the Inuit," Bernier said. Franklin's party disappeared while searching for the Northwest Passage in 1848, following their captain's death partway through the expedition. Their ships haven't been found, despite numerous searches. Parks Canada is planning another search for the Erebus and Terror in August. The site is of interest not only because of its importance to marine history and the Inuit, Bernier added, but because it illuminates a fascinating piece of human history. There were 60 men in the group who were stuck at the site for more than two years, he said. "It's also a survival camp."